Brother’s Lounge, 3812 Farnam St.
Chicago garage rock duo are the real deal brother-sister act of guitarist Alex White and her drumming brother Francis White. 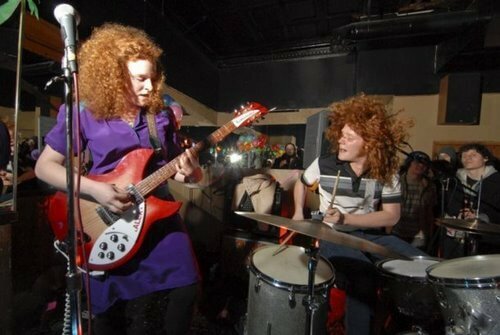 The live show is a wild rumpus of flying red hair, huge guitar riffs and Francis White’s bumping drum beats. The band keeps everything in-house booking tours, making band merchandise and releasing albums themselves. The latest album is 2011’s Blood & Venom keeps the vibe fun, with songs focused on the seriousness of snacks, parties and birthdays. Alex plays loose, slightly bluesy, mid-fi guitar blasts while both Alex, with a voice that sounds like she could be Patti Smith’s excitable kid sister, and Francis shout out their vocals. The band also plays the Zoo Bar, 136 N. 14th St. in Lincoln, Sunday, March 4th.